One of my weekly little pleasures happens every Friday afternoon: I turn off the monitors on my work computers, swap my Pebble Smart watch for the old school analog one Shira bought me in college and plug in my Galaxy Note 5. If all goes as planned, the computers, smart watch and phone remain untouched from Friday night to Saturday night; the duration of Shabbat. I'm not nearly as strict about observing Shabbat as some of my fellow Jews are, but I do relish the experience of being unplugged and mostly unreachable. Usually this disconnected status is rejuvenating, but on rare occasions it can be frustrating or even downright unsafe. Emergencies do happen, and being able to send and receive calls can easily go from a nuisance to an absolute necessity. Over the years Shira and I have debated the risks and benefits of not carrying a phone on Shabbat and Jewish Holidays and we finally arrived at potential solution. My plan: pick up a dumb phone that she, and only she, has the number to. This covers the emergency side of things, and if done right, avoids adding a gadget which will be yet another distraction. After much research we finally settled on simply adding a 3rd line to our T-mobile account. I looked at various pre-paid and non-contract options, but none were as cheap as the $9.99/mo that T-mobile charges us for the additional phone number. Ideally, I would have added a Verizon number, as they have the largest network and so my Shabbat-phone would also double as a works-when-T-mobile-doesn't-phone. However, I couldn't find an economical way to do this, and would have almost certainly ended up with exactly the kind of Android phone I'm trying to avoid using. I ordered the service with T-mobile and 24 hours later I had a SIM card ready to drop into a GSM capable phone. Off to Amazon I went in search of a compact and bare bones phone. I could hardly believe luck when I found the AEKU M5 phone. It's marketed as a ultra thin, credit card sized phone. At $19.39, it appeared to be compact, cheap and dumb, exactly what I was looking for. A few YouTube reviews later I was convinced that this was just what I was looking for and hit the buy button. It does have nearly the exact width and height of a standard credit card, though it's clearly much thicker than one card. I doubt you'd want to put this in a guys wallet, though it would certainly fit into a larger ladies wallet. 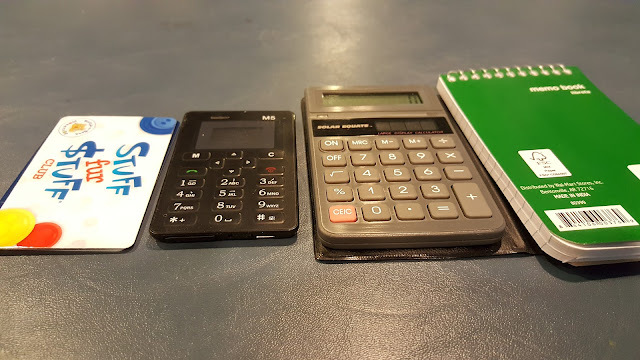 The comparison between the phone and calculator is almost staggering: the phone is noticeably smaller in all dimensions. OK, so it's small. But does it work? Indeed it does. I had no problem figuring out how to make and accept calls, add to the address book and even send off an SMS to Shira. You might assume that all dumb phones are easy to use, but you'd be wrong on this. Last year, I used a Verizon dumb phone which had horrendous usability issues. Even after owning the phone for months I still couldn't tell you which button you needed to press to answer a call. As I started to play with the M5 I kept waiting for the missing features to pop-up. Did it have vibration? Sure does. Oh, does it have a speakerphone? Yes, sir. What about the ability to easily put the phone in silent mode? The M5 has this covered, too. In fact, it has the classic 'profiles' setup that anyone over the age of 40 will no doubt remember from the good old days. You can select between General (ringing), Meeting (vibration), Outdoor (ringing + vibration) and Silent. The M5 allows you to customize these profiles and offers method for quickly switching between profiles. While I haven't tried it yet, the phone appears to have support for 3 way calling, muting a call and putting someone on hold. 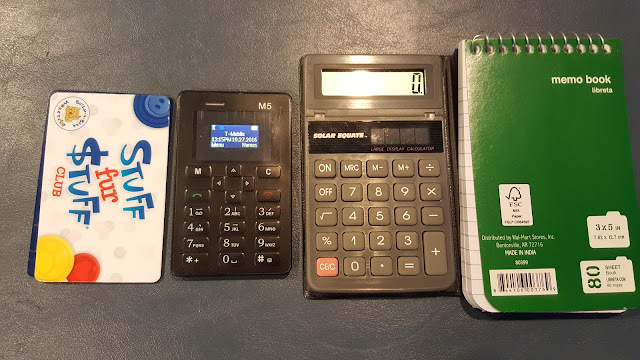 The phone offers alarms, a calendar and a calculator. The build quality is OK. For a few more bucks you can pick up a credit card sized phone which appears to have more polish to it. But the M5 is totally functional and considering the price tag, well made. The battery is tiny (320mAh), but a phone like this sips battery juice. After 24 hours the phone was down from 3 bars to 2 bars of battery. The phone uses the same USB plug as my Galaxy Note 5 to charge, so charging it is effortless. In terms of the issues, I've only noticed two. First, the earphone speaker isn't especially loud. This means that when I want to chat with Shira and I need to find quiet place to do so. The other issue: the phone offers an FM radio, but requires that you plug in a headset for it to work. Alas, there is no headset jack. That appears to be the only feature the software provides that the hardware fails at. Speaking of earphones, the phone appear to support Bluetooth, though I've yet to try it out. When you factor in size, cost (under $20!) and features, the M5 has to be one of the most remarkable phones I've ever owned. After carrying (and mostly forgetting about the phone) during the last set of Jewish Holidays, I can say that it's absolutely doing it's job. The phone disappears into any pocket, remains in vibration mode, and just stays out of the way. But do you need one? That's debatable. As a backup phone, I suppose it could be handy. I can also see it working for kids; perhaps if you want them to be connected but don't want the distraction of a Smart Phone. It's basically the modern day equivalent of a pager, where quick and simple communication is prized above everything else. If you need this, then the M5 is definitely the way to go.